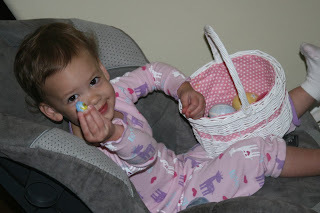 Silly Mommy : Easter: Ups & Downs, but we made the best of it! 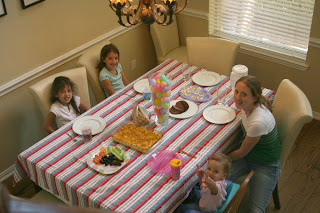 I'm a little behind with posting, but here it is- Easter at our house 2009! Cali got a nasty virus(that Ella is now enjoying as I type-ugghh) last weekend which she also ended up getting Croup from, so that wasn't fun. Joey stayed home from church with her on Sunday and it was disappointing to not all be there together. The kids will just have to all wear their new Easter dresses this coming Sunday(if we are all well, that is!) 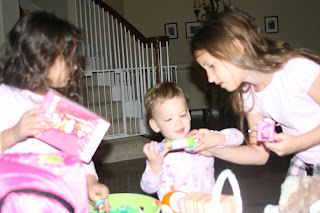 So, it wasn't the picture-perfect Easter, but we still managed to have some fun, despite illness. 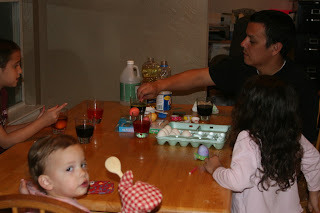 We did the traditional egg dying on Easter Eve. 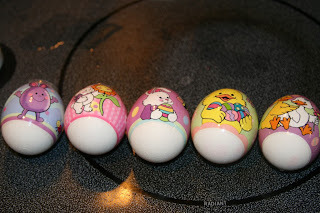 . .
We did a few of the wrapped eggs this year and they turned out cute. I love doing these eggs. Its like magic the way they wrap around the eggs. I'm easily amused. 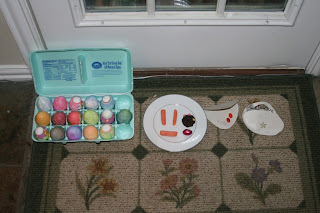 We left some goodies and letters for the Easter bunny along with the dyed eggs for him to hide for us. He, of course, hides his own candy-filled eggs too. Ella taped her note on the door along with a necklace for him to wear. This is so Ella:) She loves tape and uses it daily! 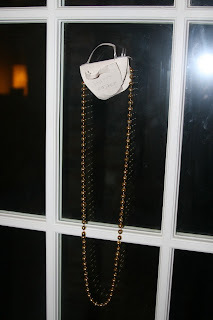 Aubrey had made a pouch(see picture above) with a necklace and a note. Both of their notes told him how much they love him. I know he loved everything:) These girls are so thoughtful and sweet I tell ya. 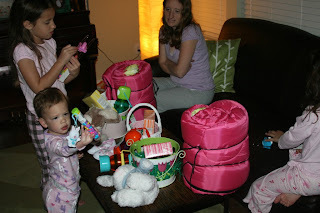 The Easter bunny surprised the girls with all kinds of stuff! 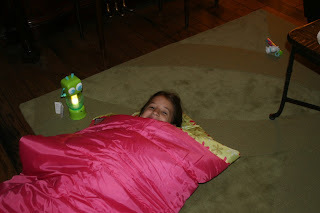 Chocolate bunnies, candy, thingamajigs, sleeping bags and lanterns(the Easter bunny must know of our plans to do some camping soon-Joey can't wait! He just got a tent from his parents for his birthday and we are gonna test that bad boy out this month). 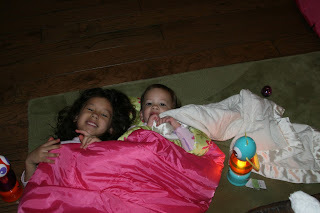 I love holiday morning sleepy faces and smiles. Cali's carseat was in the house(I had cleaned the car on Saturday and hadn't put it back in the car yet). While it was in the house, it was her favorite hangout spot. Here she is chillin out after hunting eggs in the house. Yes, that was another damper. 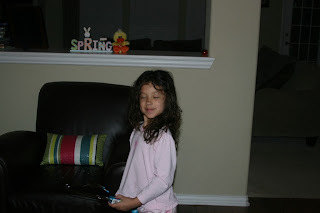 Our Easter was very cold, rainy and thundery, so the Easter bunny had to hide the eggs in the house. But the kids didn't mind at all and had a blast running around the place. Time for dinner! It was just the 5 of us this year. We missed all of our extended relatives dearly, but still had a lovely dinner together as a family: ham, potato casserole, whole wheat breadsticks(Aubrey's primary teacher gave these out at church-thanks! We all enjoyed them! ), relish tray/veggie tray & deviled eggs. In the evening, I attempted to make a bunny cake. Well, that stupid bunny did not want to come out of the pan. I guess I'm no cake pro like my lil sis. He came out in a million pieces. I guess this just isn't my talent. Tara, stop laughing. The kids made the best out of the mess I gave them and actually whipped up something that looked like a bunny. Great job guys! You totally covered up your Mom's mistake! Hope y'all had a FANTASTIC Easter with the ones you love! Yeah, but I bet the bunny cake tasted great. Looked like a fun day. we have spent many a holiday on our own with most all of our extended family in az and us in ut. but it works out and we all make our own little memories and traditions. ....except for the cake, that is. Looks like you guys had a good Easter even though some of you were not feeling well. Hope Ella starts feeling better soon. Cute pictures! How fun looks like despite the illness everyone enjoyed the day. Love the sleeping bags the colors are great. Cali you are too cute. Aubrey and Ella I bet the Easter Bunny loves coming to your house for all the special treats he gets he's a lucky funny bunny for sure. You guys just know how to have the best fun! I hope everyone is feeling better soon and that you can all get to church together. What a blessing that must be to have your whole family in the church. I can only wish . . . 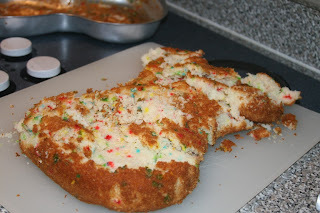 I had a little giggle from that cake picture, but once the frosting is on it doesn't look sooo bad! I bet it was still yummy! Hope everyone gets healthy quickly. Tons of fun at the duenas house! Happy Easter to all!! You always do it right. That is so much fun. 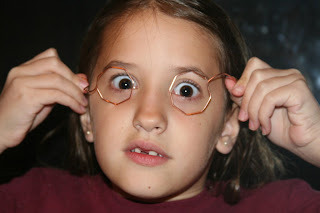 I am cracking up at how the girls made those egg holders into glasses. I never thought of that before. Clever girls. Love all the loot and that bunny was awesome. Great job silly momma. The cake turned out cute though! You tried and each time you try it will get better. Cute pics! Sorry your girls are sick. 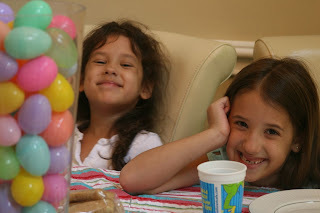 What fun easter times! The bunny cake. .. well Holly you can't be perfect at everything! 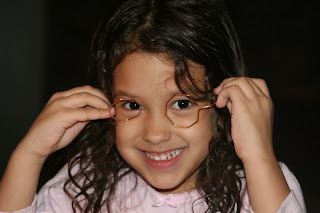 You guys always have so much fun with the holidays and your adorable girls! 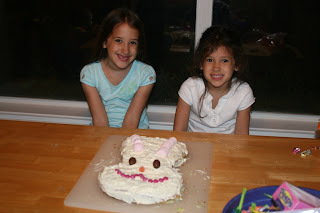 That bunny cake ended up lookin pretty good! I'm sure it was still pretty tasty. I'm sorry Cali was sick but it looks like you made the best of it. I'm sad we didn't get to share the holiday together :( I loved all the pictures!